The tradition of corporate daily prayer in the Christian tradition developed directly out of the Jewish practice of reciting prayers at set times of day (e.g. the Apostles Peter and John attending afternoon prayers in Acts ch. 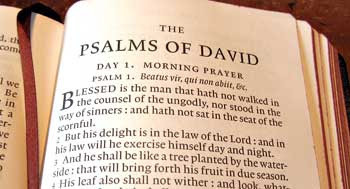 3 v. 1; or the imperative in Psalm 119 v. 164: 'Seven times a day I praise you for your righteous laws'). It is assumed that this practice was handed down directly by the first Apostles into the Church. This daily prayer was widely formalised in the monastic tradition of the Church. A key part of these prayers is a recitation of the psalms, often set to music. These are the same psalms which would have been chanted in the Temple in Jerusalem from c. 1000 BC﻿ onwards. By the 9th Century AD the monastic tradition of the Office (also called the 'canonical hours') was split into eight separate prayer services: lauds, prime, terce, sext, none, vespers and compline, and vigils. Again this was done to reflect Jewish tradition recorded in scripture and to respond to the call to meditate on the law of the Lord day and night (Psalm 1 v. 2) and to pray without ceasing (1 Thessalonians ch. 5 v. 17). The discipline to a life of ceaseless prayer became the remit of the monastic tradition until Thomas Cranmer tried to reclaim this tradition for the general populace. In Cranmer's Book of Common Prayer, first published in 1549, he combined the eight-fold Office into two services, Morning and Evening Prayer. It was Cranmer's desire that every Christian up and down the length and breadth of England could have access to a copy of the Book of Common Prayer and join in the discipline of twice-daily prayer. The Church of England still practices the discipline of daily prayer. The services of Morning and Evening Prayer are steeped in scripture, combining Psalms, Canticles (songs from the bible) and other readings together with formal prayers. The purpose of this Daily Office is to frame our days in prayer, allowing us to bring all that is on our hearts to God. The power of the Daily Office is that when prayer seems to dry up and words are difficult to find and God seems remote, these words can become a bedrock through which God can still speak to us and nourish us. Services of Morning and Evening Prayer taken from Common Worship are said in public Monday to Friday in this Benefice (see our worship schedule for details). The services are led either by a member of the clergy or a lay person. Readings are chosen according to the Revised Common Lectionary and the NRSV translation of the bible is used. Please feel free to come along and join us, or just to sit and listen to find out more about what engaging in the Daily Office is like. On Sunday evenings we sometimes have a service of Evensong from the Book of Common Prayer. This is often sung by the congregation using Anglican chant in the traditional manner. There is usually a sermon based on the Revised Common Lectionary readings for the second service. Readings are usually taken from the Authorised Version of the Bible (King James' translation). Please see our worship schedule for details of when we have Evensong.